Material: High quality plastic. Pins Size: 16.5 x 3 x 3cm. Balls diameter : 8.5cm. It\'s a little light so that suitable for kids play indoor. Include: 10 colorful plastic skittles and 2 balls. The ball size is suitable for 3-6 year-old kids. 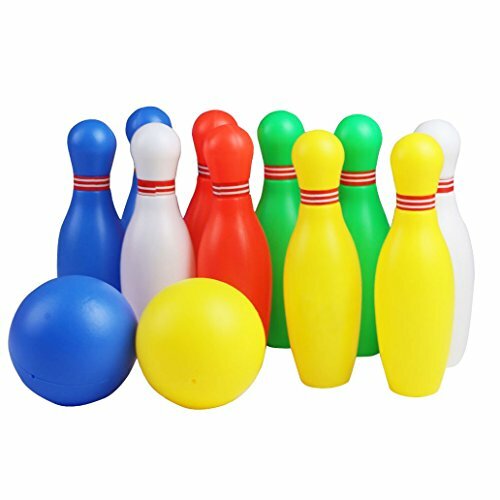 Perfect indoor skittles for kids: Children can enjoy a fun bowling game wherever inside or outdoor. Convenient to be carried on holiday, garden play or party. Kids skittles set: Good for children to practice hand coordination and concentration. Different colors attract kids to play, a good learning activity. WARNING: Suitable for age of 3+. To be used under the direct supervision of adult.